The wait is over Microsoft launched Nokia X2 on Friday , price at Rs. 8,699, in India to compete more with the likes of Samsung as well as Micromax. Nokia X2 was launched globally in June as a successor of Android Nokia X phone. Nokia X2 is represent the evolution of the Nokia X family, providing an enhanced experience across user interface, hardware and apps as according to Microsoft. In February of 2014, Nokia had announced the Nokia X family is affordable smart phones, running with Google's apps, at the MWC in Barcelona. 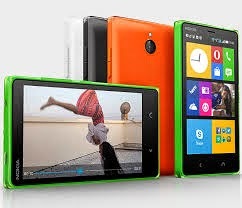 It has four devices i.e Nokia X, Nokia X+, Nokia XL and Nokia X2 which are under the Nokia X range. It consist 1.2GHz dual-core Snapdragon processor and the dual SIM phone will have a 4.3 inch Clear Black display, 1GB RAM, 5MP rear camera and the VGA front camera and 1800 mAh battery. Did You Watch The Drop 2014? Nexus 6 is expected to be released soon !!!! !